• Where his inspiration came from in starting this project. • Spotted a need and aimed to fill that need. • Forming a board of advisors. • Creating a business plan. • Common magician mistakes: not knowing your audience, not knowing the story, not making eye contact, originality, taking criticism. • Specificity – every single second should be accounted for. This allows you to test and measure things and find the best options for timing and movement, etc. • Physicality – the physical life and nature of your persona on stage. • If you don’t have a script, write one. • Kill all stock lines. • Exercise and take care of your body. • People don’t care about you or the show. They’re looking for an escape from their day-to-day life. Called the music incorrectly when calling cues for show. They weren’t able to recover. Ouch! BAM! Starting Bay Area Musicals! Raising capital. You don’t want to set sail until you can afford to sink. • Talks about moving out to San Francisco and how he went about it. It was very calculated and planned. • Talks about his background in magic. 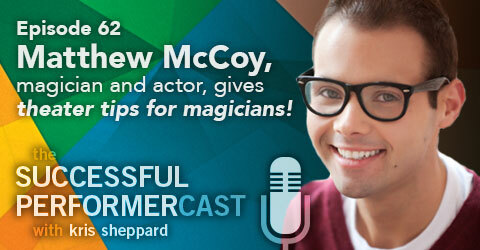 • His involvement in Magic at the Beach and producing variety shows. Apple Calendar with alerts and a giant wall calendar to show a bird’s eye view. Where can we find Matthew McCoy?